The Adirondack Coast Visitors Bureau announces Battle of Plattsburgh Bicentennial Commemoration Events and Attractions. 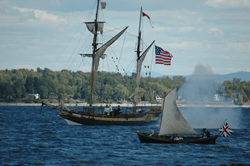 The Adirondack Coast along Lake Champlain hosts an annual series of reenactments, historic tours, family-friendly Adirondack events and performances to commemorate the Battle of Plattsburgh, the decisive battle in the War of 1812. In September of 1814, more than 10,000 British regulars, many fresh from victories in the Napoleonic Wars, invaded northern New York from Canada while the Royal Navy advanced along Lake Champlain. Their intent was to reach New York City and divide an infant nation in two. But 25 miles south lay the village of Plattsburgh and Cumberland Bay defended by 32-year old General Macomb’s 1,500 regulars and a small American fleet commanded by Commodore Thomas Macdonough, only 30 years old himself. On the morning of September 11th the armies clashed in tiny Plattsburgh with Sir George Prevost in command of the redcoats. At that same hour, the British fleet rounded Cumberland Head where they met the anchored Americans poised and ready. A dying wind left the British unable to maneuver their ships giving the out-gunned American ships the advantage. Within three hours the British colors were struck and their commander Captain Downie lay dead. Seeing his fleet defeated and lacking information about the strength of American ground forces, General Prevost withdrew his troops back to Canada. The unlikely American victory thwarted British plans to control Lake Champlain and led to the signing of the Treaty of Ghent and the end of the War of 1812 on Christmas Eve 1814. The Battle of Plattsburgh, also known as the Battle of Lake Champlain, ended the final invasion of the northern states during the War of 1812. Join the Adirondack Coast as we commemorate the Bicentennial of General Alexander Macomb’s and Master Commandant Thomas MacDonough’s unlikely defeat of the British army on September 11, 1814. The week’s series of events commemorate Plattsburgh’s military history, industry, culture and arts providing visitors a unique look at the War of 1812. Enjoy re-enactments on land and water, old fashioned parade, craft demonstrations, fife and drum performances, concerts and lectures. Experience history first hand at a War of 1812 Boot Camp. The Boot Camp allows a unique opportunity for an experiential understanding of this important time in history and how it touched four nations. Tailor your Boot Camp experience by choosing the activities of most interest to you such as musket loading and firing, military drills, mock militia battle and open fire cooking. Historians and period re-enactors will share their expertise with you in a relaxed atmosphere. Follow the path of the British south from Canada to Plattsburgh along the War of 1812 Interpretive Trail. See the area’s rich history with sites such as monuments, former battlegrounds and historic homes. There are 10 stops along the marked trail each with its own descriptive signage making the War of 1812 Interpretive Trail an easy and fun way to discover the past. A War of 1812 Historic Map is available for more detailed information and to help identify the sites along the trail at goadirondack.com. Artifacts dating back to the War of 1812 have recently been uncovered at this archeological excavation site. Zebulon Montgomery Pike Jr. was a United States Army Captain in 1806-07, who also served during the War of 1812 at a military encampment somewhere around Plattsburgh. So far, archeologists have found a 1795 bayonet scabbard chape, .69 caliber bullet and military jacket buttons stamped with the number 15 – Pike’s Regiment. The dig will continue throughout the summer of 2014 and beyond. Visit the Adirondack Coast’s newly designated Peace Garden at the Kent-Delord House Museum, former British Headquarters during the War of 1812. Dedicated at historic sites in the Great Lakes region of the United States and Canada, War of 1812 Bicentennial Peace Gardens celebrate the two hundred years of peace and longstanding friendship between two countries that share the world’s longest undefended boarder. Get a taste of the area’s history with Plattsburgh’s artisan beer, Plucky Rooster Ale. This new artisan beer has been hand-crafted by Legend’s Bistro Brewmaster Jason Stoyanoff to commemorate the War of 1812 bicentennial. Plucky Rooster Ale was created by carefully researching the types of beers brewed by George Washington and Thomas Jefferson in the late 1800s and 1900s. Using American hops, English rye, Canadian barley and molasses – Plucky Rooster is a “burly” pale ale with toffee notes and a hoppy aroma. The name owes its genesis to a 200 year old rooster that was aboard Macdonough’s ship, USS Saratoga. Created by North Star Vineyard this Crab Island White is a semi-dry Seyval Blanc, medium-bodied white wine and has flavors of Honeydew melon, green apple and citrus. Crab Island was the site of the military hospital during the War of 1812 and is now a federally recognized military cemetery and the site of 149 American and British soldiers who were killed during the battle. On approaching the island visitors can see a large granite monument commemorating the lives of the soldiers who are buried there. Crab Island is public land and can be visited; however, visitors can not disturb or collect any artifacts, or damage vegetation. Elfs Farm, Winery and Cider Mill honors Two Heroes with its early American style cider. This whisky barrel cider commemorates General Alexander Macomb’s and Master Commandant Thomas MacDonough’s for their actions on land and water during the Battle of Plattsburgh and the unlikely American Win. The Battle of Plattsburgh did not take place until two years after the war was declared, yet it marked a turning point and heralded the end of the hostilities. For more information on this unlikely defeat of the British, visit champlain1812.com.